James Hagerty was born and raised on the Vineyard, graduated from Northeastern University, and served in the Marine Corps before joining the Oak Bluffs police department. Oak Bluffs police officer James Hagerty has been named the new Edgartown town administrator. 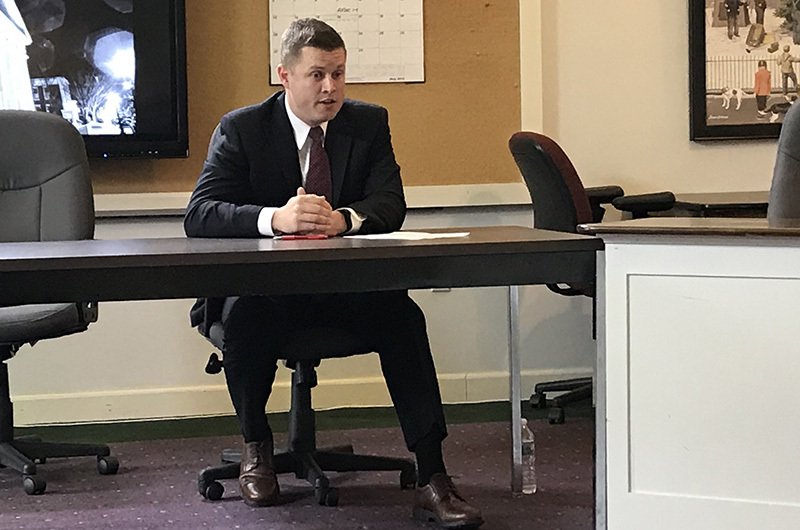 Selectmen voted unanimously Tuesday to offer Mr. Hagerty the job after interviewing four candidates. He will replace retiring town administrator Pamela Dolby when she retires in July. “I was amazed at James Hagerty’s qualifications,” selectman Margaret Serpa said before the board voted to offer him the job. Selectman chairman Michael Donaroma called Mr. Hagerty to tell him about the board’s decision. “He accepts,” Mr. Donaroma told the other selectmen, who cheered. The other finalists interviewed Tuesday were Edgartown procurement officer Juliet Mulinare, Tim O’Leary, assistant field officer at Los Alamos National Laboratory in New Mexico, and John Ardaugh, an attorney from Manhattan, Ill. The candidates were selected by a committee appointed by selectmen. Mr. Hagerty was born and raised on the Vineyard, graduated from Northeastern University, and served in the Marine Corps before joining the Oak Bluffs police department in 2016. He also has an MBA. Selectmen said they were impressed by the four finalists, particularly Mr. Hagerty and Mr. O’Leary. Mr. Hagerty’s qualifications and Island roots won over selectmen. “I would say he checks all of the boxes for me,” selectman Arthur Smadbeck said. The board said they were happy Ms. Mulinare applied. Selectmen said Mrs. Dolby would stay on board through the Fourth of July and help Mr. Hagerty with the transition. Great choice! Good luck in your new job James. Great choice. Has all the qualifications. Knows the community... congratulations Hag! The town will be in very good hands. Congratulations James. I have no doubt that you will do this position and our town proud!! Good job selectmen!! A tough job and looks to be a tough guy who can take it. Good luck and happy to see we have a homegrown talent who should stay around for a long time. Congratulations on your appointment James. You have the character and the ability to be successful in your new role. The Board made the right decision. This is a powerful choice by the selectmen. There is zero doubt the man is an accomplished leader under circumstances few of us can imagine. He has deep island roots, and an intellect, educational degree and drive worthy of the position. He certainly checks all the boxes. I'd like to ask that he devote some effort towards opening the government here to non-insiders. Edgartown has deep pockets and is extremely fortunate to be able to fund all sorts of initiatives. A quick glance at the town website is disheartening for someone like me...a newcomer (by island standards). There are hardly any minutes posted of the important meetings by boards that impact all our lives. Selectmen meetings happen in the blink of an eye, as if decisions were made beforehand. The ZBA doesn't even attempt to post meeting minutes and offers a couple decisions a year when dozens are made. It is a bit of a gauntlet. I, and other washashores who contribute to the community feel very hesitant to approach town hall or question anything. Public records requests are met with subtle and not so subtle interrogations. Again, a powerful choice for a town manager. Please use the power to shine a light on what goes on in our government. It is the first step in a better edgartown. It is also why only two people who had ever been to the island made it to final interviews. It really was startling...a job that pays closer to 200k than 100k, and not one person with municipal government management experience was interviewed.